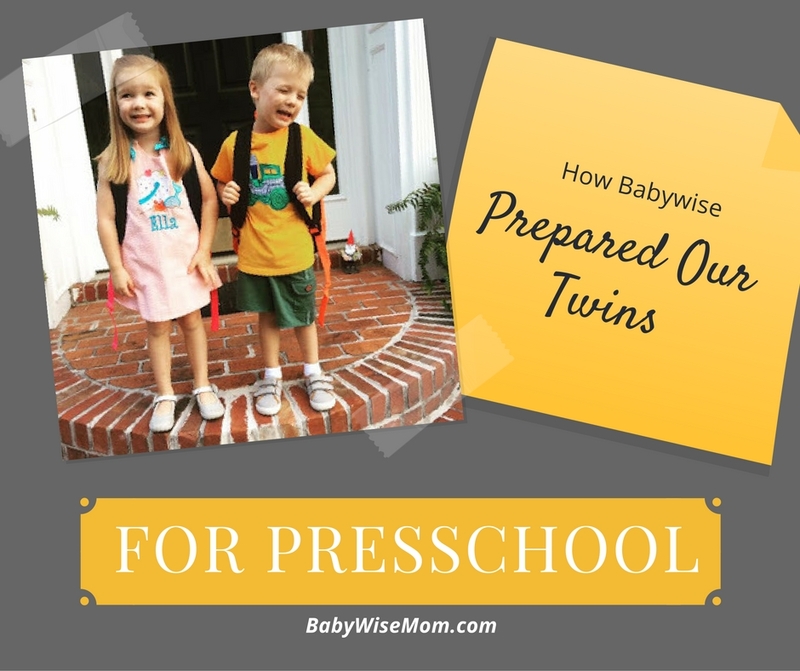 Schedule – Thanks to Babywise, our twins have been on a schedule since day one! Even now, at age four, they love operating off a routine. They can predict what their day will look like, and as a result be confident and secure. They know when we expect them to get up, eat breakfast, have free time, clean up, rest time, etc. To this day, both of them take a two hour long afternoon nap. I believe they thrive in knowing what to expect from their day and can operate independently knowing what their schedule is! They can anticipate what comes next, and mentally prepare for it without our prompting. I believe this will serve them well in preschool as they adapt to a new routine. 2. Obedience – Thank you Babywise for helping us instill obedience in our twins. Babywise reinforces the principle “Train up a child in the way he should go.” Babywise reminds parents to be clear, concise, and consistent. Just like having a predictable schedule, our twins learned what was acceptable and unacceptable behavior. Yes, they tested us, and yes we had to do a lot of reinforcing, but if you remain consistent in what obedience looks like they will catch on. They learned and are still learning that decisions have consequences. At school, I believe they will operate off a similar system (a set of classroom rules) and that similar behavior will be expected: kindness, respect, sharing, etc. I’m confident they will respect their teacher, just as we expect that of them at home. Independence – Thank you Babywise for helping us value the gift of independence! I’ve seen many parents fall into the trap of needing to be the center of their child’s world. It’s easy to fall into, a sweet snuggly baby comes to your home, and suddenly they become the center of your world. It could have so easily happened with bringing two babies home. We could have let them set the schedule. Thanks to Babywise my husband and I didn’t lose each other when the twins entered our world. We didn’t let them sleep with us or even in our room. I valued sleep too much to give that up. Once our schedule was established, we knew each night when they would go to bed and we would have time for us as a couple. We knew when we could have uninterrupted conversation, and we knew we could entrust them with a sitter because their behavior and schedule was predictable. It has allowed us great freedom. 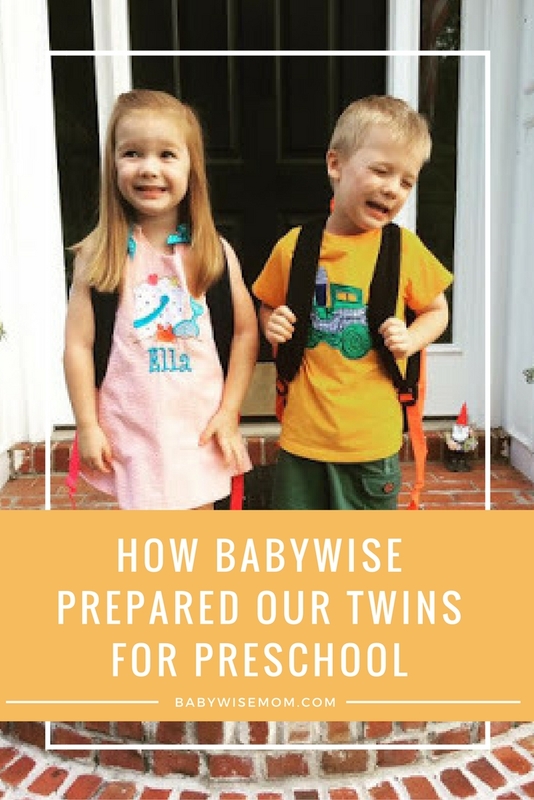 I believe Babywise was a constant reminder for us that our end goal is to prepare our children to be independent, that was the mindset we have tried to parent with since day one. We are building for the future. With our end blueprint in mind, we want our twins to be independent, productive, Christ-centered individuals. I was ready to let them fly this year, because I knew they were ready!